Strep rash (scarlatina) is also known as scarlet fever often accompanies strep throat, but don’t confuse this with common types of skin rash like those caused by allergic reactions. Strep Rash (ie. 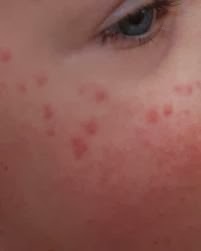 Scarlet Fever or Scarlatina) can very often be mistaken for other similar skin related illnesses such as Chickenpox, Measles and even Psoriasis. It most often starts within 48 hours after the symptoms of Strep Throat appear and it will take the appearance of a red rash which develops on your child’s face or torso. Over the next day or so after symptoms appear, the rash will quickly spread to other areas of the body including the hands, neck, arms and legs. 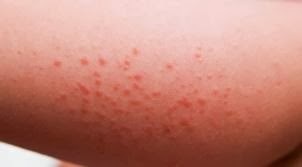 The rash itself is reddish in color, similar to sunburn, and can consist of many small red pimples over the affected areas. For children, the areas where the skin flexes and folds (i.e. arm pits, elbows, neck area, etc) can become the most irritated as movement in those spots tends to create the most pain and itchyness. Peeling of the skin, again much like sunburn, is also something that can occur during the final stages of the illness. Strep Rash can also include other symptoms such as head aches, fever, red lines on the skin, bumpy tongue and itchy skin and can be very uncomfortable to children, as most skin conditions are. The good news is that with proper treatment Strep Rash or Scarlet Fever is totally curable and will resolve itself over time. Some children with milder cases of Strep will only require a few days begin feeling better while other more serious cases may take upwards of a few weeks to totally get over the infection. In order to best treat Strep Rash it is highly recommended that children are treated as quickly as possible by their Pediatrician. Once diagnosed, most doctors will immediately prescribe an antibiotic specifically for treating bacterial infections like Strep. Within the first one to two doses of the antibiotic, most children will begin to feel much better with continuing improvement over the next few days. Treating the symptoms of the rash is mainly done via over the counter medicines and lotions. To help relieve the itchy skin issues most doctors will recommend an allergy product such as Benadryl which is very effective in masking some of the side effects from the irritated and itchy skin. In addition, bathing with Aveeno Skin Relief Bath Treatments and using Aveeno skin lotions is highly recommended to relieve the itch associated with the rash. As with any illness, parents should keep a close eye on children diagnosed with Strep Throat, Strep Rash, Scarlett Fever, etc as the severity of symptoms can change at a moments notice. If the rash starts to become more severe or a high fever develops, do not hesitate to take your child to the hospital or a Ready Care facility for immediate assistance.